No Wrestling Spoilers: How do you solve a problem like Seth Rollins? WWE pulled off a masterstroke when Seth Rollins turned on his Shield 'brothers' Ambrose and Reigns. Not only was it one of the best heel turns in a LONG time, but also, and maybe more importantly, it has been the launchpad for the three members of The Shield to go solo. For Roman Reigns the objective appears to be a clear one from the WWE; To get him over enough as a singles wrestler in order for him to eventually become World Heavyweight Champion. As discussed by many industry experts the ideal time for this would be at Wrestlemania 31. Maybe against Brock Lesnar? Who knows? 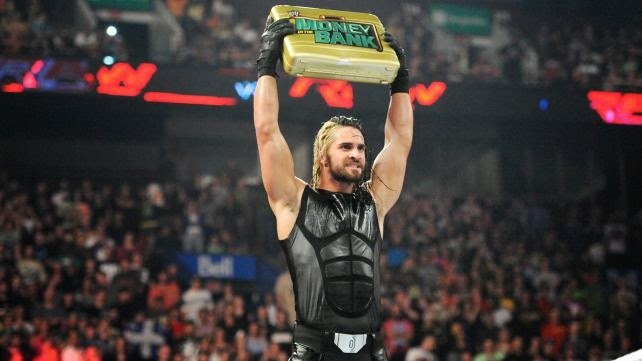 The one thing we all know for sure is that Seth Rollins is currently Mr. Money In The Bank. Usually this would be a good thing for any WWE superstar to have in their possession and it may well turn out to be that way for Rollins too. However I'm struggling to see where a Rollins title reign fits into the masterplan. And more importantly if he is ready for it yet. Like most people, I'm expecting Lesnar to pick up the belts at SummerSlam. If he does take the titles from Cena, can you really see Rollins cashing in MITB against The Beast? Lesnar is one of the most dominant Superstars in WWE history. He manhandled the Undertaker at Wrestlemania. He may well do the same to Cena at SummerSlam. So what chance does an upstart like Rollins have against Lesnar? In my opinion; Very little chance. I just don't think I could buy into him pinning Lesnar 1, 2, 3. If Lesnar does win at SummerSlam you would imagine his title reign will be a fairly dominant and long-lived one. Some have even speculated that a Lesnar title run could stretch right through to Wrestlemania next year, when Reigns can take the straps from him and have his moment in the sun. So here's the question; How do you solve a problem like Seth Rollins?